Gratitude is something we often have for others, but is not something we often express. I know in our own little family we do our best to say “thank you” as often as we can — it’s important to us to know that we are grateful for each other and thankful for what we do for each other, no matter how simple the act. But nobody’s perfect. And in the hustle and bustle of life, we often forget to say those two words to those we care about, even if we feel thankful in our hearts. 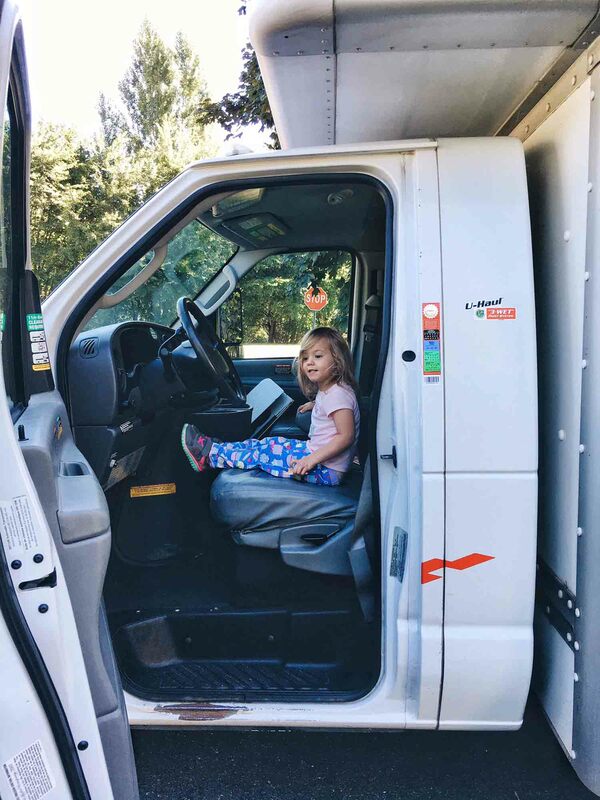 This season of life for us is especially busy — we are building a house, we are working, we are traveling, we are heading from errands to meetings to play dates and back again. I know you probably feel the same way, too. But maybe it’s time to take a moment, just one moment, to show someone in your life that you care about them — with chocolate. And what better day to do it than today, on National Thank You Day? 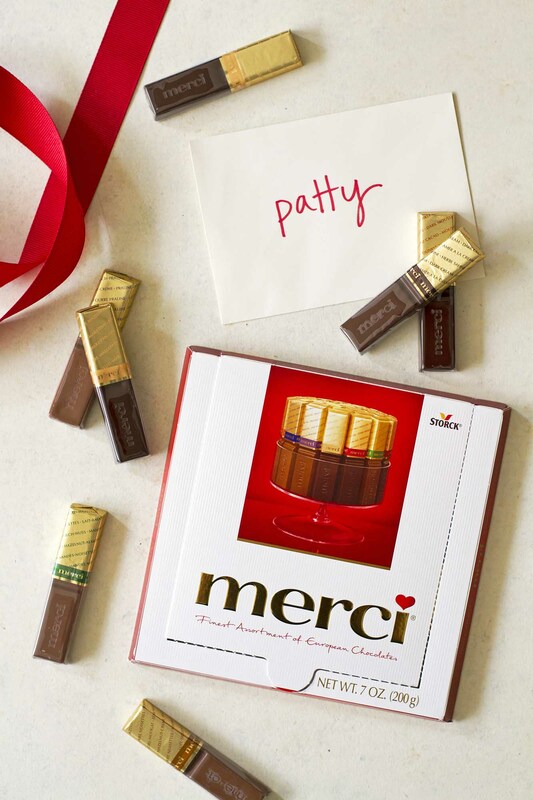 To be honest, I didn’t even know National Thank You Day existed until the folks at merci® chocolates contacted me about participating in their initiative for the holiday. 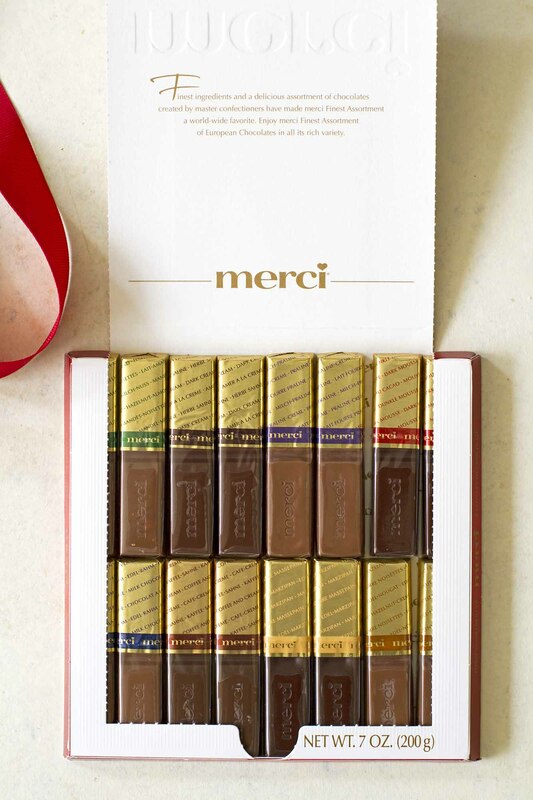 Today, to facilitate expressions of gratitude, merci is celebrating National Thank You Day by handing out delicious chocolates to commuters and passersby who post a thank you note on the brand’s life-size “Thank You Wall” in New York City. Commuters and candy lovers in the NYC area will have the chance to post their own handwritten thank you notes to merci’s Thank You Wall and share real-time social shout-outs via an onsite video/photo booth. I don’t know about you, but that makes me want to jump on a plane right now and head over to New York City to get in on the gratitude game (and the chocolate, obviously). But since I can’t drop everything and hop on a jet plane, I’m showing gratitude in my own backyard — or rather, my neighbor Patty’s backyard, also known as Avery’s playground. Nearly every day, Avery will head over to Patty’s yard to play on her swing set and in her sandbox, even when Patty isn’t home. But Patty doesn’t mind — in fact, she has always invited us to come over whenever we want. It’s the kind of neighbor she is. 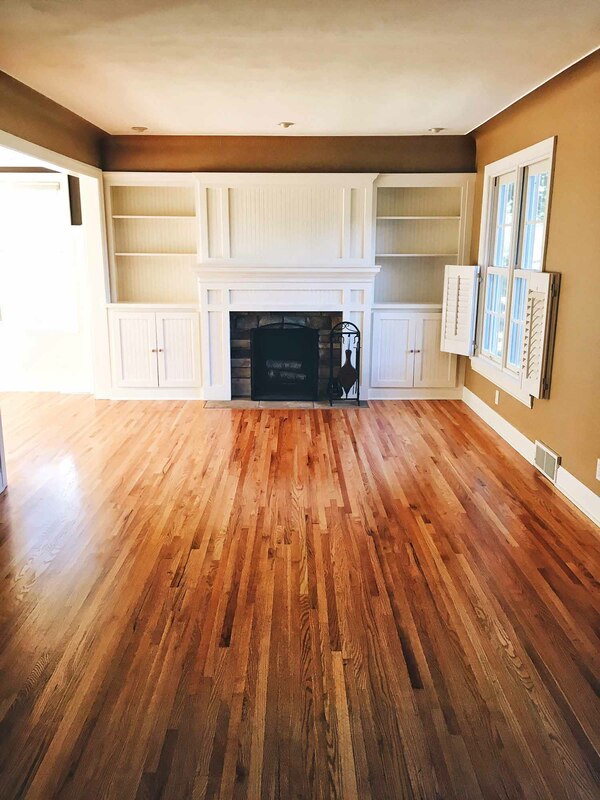 I remember when we first moved into our house and the previous homeowner was giving us a tour of our then-new home. She pointed to Patty’s yard and said, “That’s Patty. She’s like the matriarch of the neighborhood. You will love her.” And in our time of getting to know Patty, it is true. She is always optimistic, friendly, warm and so kind to us and our daughter. She congratulated us in her own special way when we found out we were having Avery, and one night just a few weeks ago, she babysat Avery for us. What we didn’t know is that on that night, her own grandson was having his birthday party at Patty’s house — but she didn’t mind the extra company. She gave Avery a party hat, some cake and Avery had the time. of. her. life. She still sings “Happy birthday, Charlie!” and asks for cake and I can’t help but smile. That’s a memory I hope Avery doesn’t soon forget. Of course as we all know, we are no longer Patty’s neighbor, and the goodbye as we were moving was bittersweet. 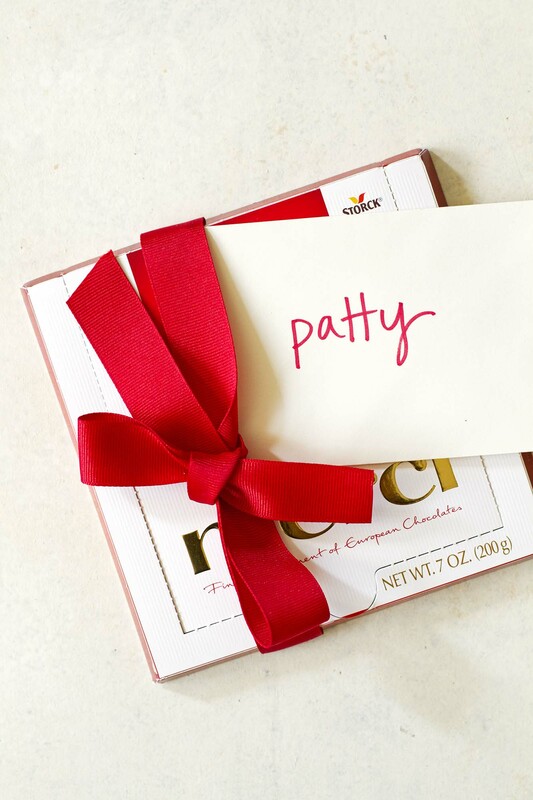 So just before we left our house, I placed a box of individually wrapped merci — a name that literally means “thank you” — chocolates by her doorstep. 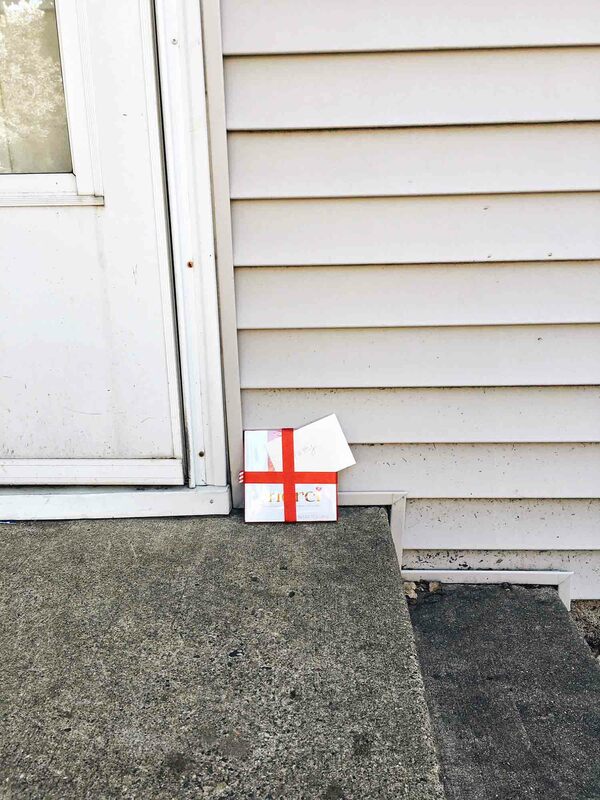 It’s the smallest, simplest gesture we could give for her neighborly kindness. And having quite the roll call of not-so-great neighbors in our past, Patty is someone we are definitely thankful for. So now, it’s your turn! To help celebrate National Thank You Day, merci is inviting everyone to express your thanks and gratitude and share how you #givemerci. You can do so by heading over to the merci website to launch the Thank You Wall and participate yourself. For more information about merci, you can check out their Facebook page. And PS — thank you, too, for being here. I think you’re pretty great. Disclosure: I received compensation from merci® for purposes of promoting National Thank You Day. All opinions are my own.